BLOG: Worried About the Weekend? For several days you've heard us talking about this storm system that could affect us Sunday into Monday. 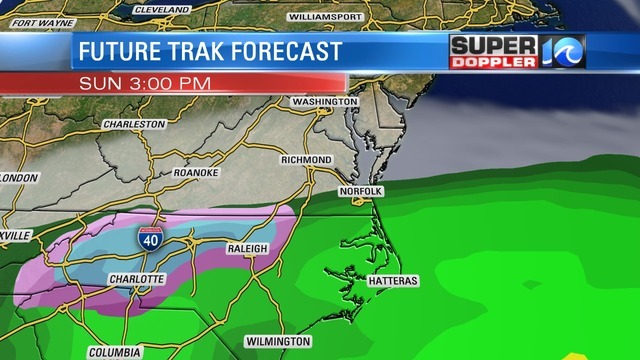 Here's the thing - it'll be a far bigger deal for inland Virginia and inland North Carolina. Should you worry about this weekend? Nah! But before we get to Sunday, lets get through today and tomorrow first. 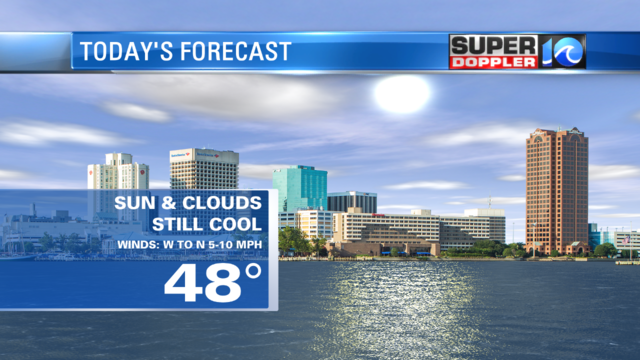 Today, we'll be tracking a mix of sun and clouds with highs in the upper-40s. Temperatures should be in the mid-50s for this time of year, so another day where we'll have to settle for cooler-than-average highs. A cold front will come through later on, but it'll be silent passage, meaning we won't see much cloud cover or any showers. Behind that front, it will be a little bit cooler for Saturday. Expect a mix of high to mid-level clouds for your Saturday with highs in the low to mid-40s. The clouds will thicken up late in the day as that storm system starts to ramp up across the southeast. The low will pass well to our south, but obviously, we will still be watching for some wet weather. Sunday will start dry with rather cloudy skies. The rain will spread from the south to the north. We are expecting mostly rain from this event. Some of our forecast models are pushing the rain farther south, meaning the Middle Peninsula, Northern Neck, and Eastern Shore may escape with barely any rain at all! HOWEVER, I'm going to keep rain in the forecast for our entire viewing area..for now. We should see light rain from Sunday morning through Sunday night into early Monday morning. It's still possible that some colder air will wrap into this system as it starts to pull away Monday morning. That's when we could see the change over from rain to a brief wintry mix. Coastal areas will see all rain. 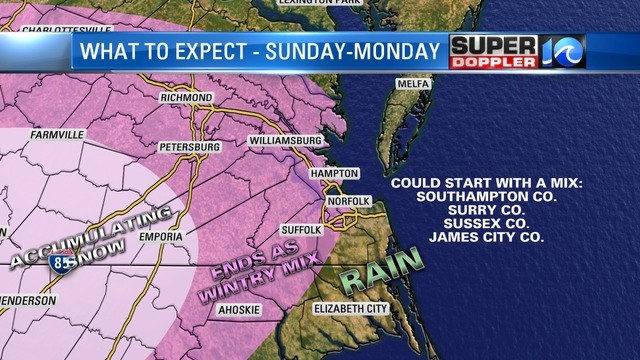 Farther inland from the Middle Peninsula to the Peninsula, through Isle of Wight Co, Surry Co, Southampton Co, Suffolk, Gates Co, Hertford Co, etc we could see this end as a brief wintry mix, but no accumulations expected. Out towards I-95 and points west, that's where you will find accumulating snow. Winter Storm Watches and Warnings have been issued for western Virginia and western North Carolina. In addition to rain, the wind will pick up Sunday night into Monday. There's still a chance for some nuisance tidal flooding, but it's not a great chance.